Louis Pasteur (1822-1895) was a scientist who had a profound impact on the world we live in today. During the course of his work he made a major fundamental leap in scientific knowledge when he devised, conducted, and disseminated a simple experimental procedure that forever disproved abiogenesis, the spontaneous generation theory of microbes. "Never will the doctrine of spontaneous generation recover from the mortal blow of this simple experiment. No, there is now no circumstance known in which it can be affirmed that microscopic beings came into the world without germs, without parents similar to themselves." Pasteur proved this with a simple experiment using swan necked flasks and heating, in which he showed that by stoppering the end of the flask after heating, the contents would remain unchanged. Flasks open to the air would allow decomposition of the contents by microbes. Among his numerous contributions to science and in particular to the field of Biology are three proposals of paramount importance: Immunization, Pasteurization and the Germ Theory of Disease. Pasteur is also credited with discovering the concept of stereochemisrty with his study of tartaric acid, and identifying the parasite responsible for killing silkworms, thus saving the French silk industry by recommending that all infected worms and mulberries be destroyed. Pasteur developed vaccines for chicken cholera, anthrax, and swine erysipelas, improving on Jenner's work of 80 years earlier by discovering that by utilizing attenuated strains of the pathogenic microbes themselves, it was possible to confer resistance. Pasteur developed a method of gentle heating to destroy disease causing microbes. 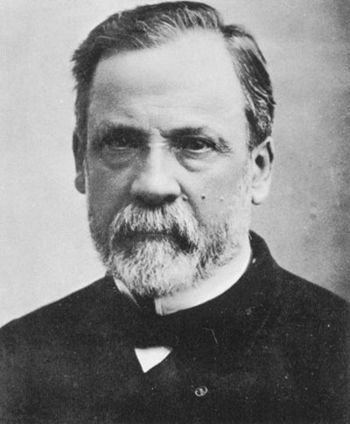 In 1854 Pasteur was appointed professor of chemistry at the University of Lille. Part of the remit of the faculty of sciences was to find solutions to the practical problems of local industries, particularly the manufacture of alcoholic drinks. He was able to demonstrate that organisms such as bacteria were responsible for souring wine and beer (he later extended his studies to prove that milk was the same), and that the bacteria could be removed by boiling and then cooling the liquid. This process is now called pasteurisation. Perhaps Pasteur's greatest achievement was the proof of the Germ Theory of Disease. Lister in England was so impressed by Pasteur's work that he began to systematically sterilize his instruments, bandages and sprayed phenol solutions in his operatories thus reducing infections following surgery to incredibly low numbers. This page was last modified 04:57, 10 February 2009.